Every Spring and Fall, 20 featured designers and over 100 guest participants accept the challenge of doing over a room/space in 6 weeks! I have been a guest participant 3 times previously and it truly is a challenge! I love the giant kick in the pants it gives me to get things done!! 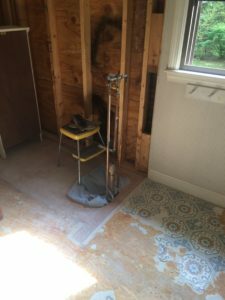 This Spring I am doing over the Main bath in my house in Hollis, NH…..I have been wanting to do this since I moved into the house, but as everyone knows…..time, energy and $$ sometimes delay our plans! In my case I have managed to raise my 2 sons and start and grow a second and third career, but now I am FINALLY going to do the bathroom!! 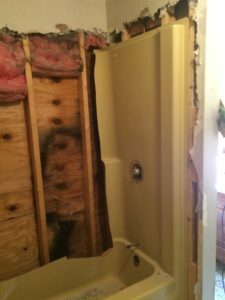 This reno has been 30 years in the making, so prepare yourself for some truly horrendous “Before” photos! 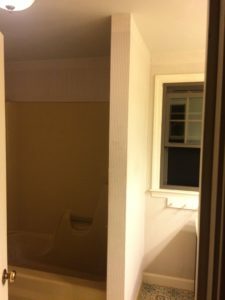 The bath, as you can see, is not large and the stud wall that holds the current plumbing completely blocks any light from the window in the room, much less the tub alcove! 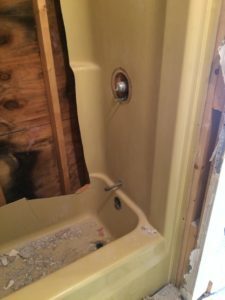 I am sure this is one of the last Harvest Gold fiberglass tub surrounds in existence but I was finally able to demolish it…and I personally had a very satisfying day with the reciprocating saw to accomplish that! 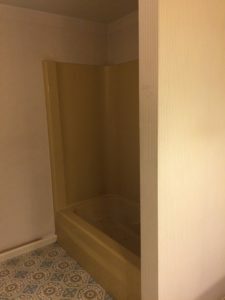 We have already removed the old gold toilet and we plan on replacing that with a much more water efficient (and more stylish) model. 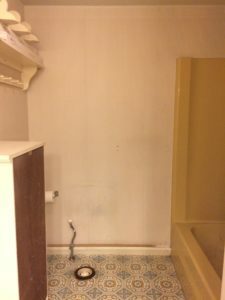 It is much easier to work in the space without the toilet in the way, in any case. Did you notice the delightful vinyl flooring? This pattern is so old, it has almost managed to come back into style – the new versions of cement tiles have similar patterns, but they look much, much better close-up than this version! 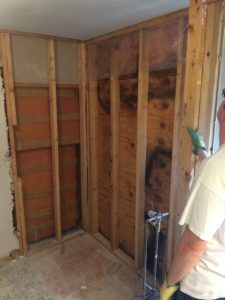 First order of business was to completely demo the tub and surround, demolish the stud wall, and remove every trace of that flooring! Thank goodness I have my oldest son to help with the heavy lifting – it was a very satisfying day to clear the decks in here! 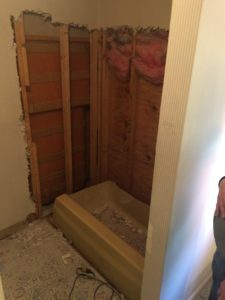 Finally we were able to get the stud wall removed and see how the space would actually feel with a little more room to move around and with light from a window that you could actually see! Next week I will show you the plans for the new design, along with the wonderful new tub, toilet and shower fixtures! I have been wanting to re-do this room for so long, the design in my head has gone through many changes, but I am very happy with the final version. I can’t wait to show you! Be sure and follow along on Instagram and Facebook as I go into things in more detail from week to week, as well as show you interim progress. And, be sure to follow along with the rest of the intrepid designers and DIY-ers that are taking on this challenge! Featured Designers post on Wednesdays, and the Guest Participants post on Thursdays at OneRoomChallenge.com. We love the comments and feedback, and there is so much good stuff going on, you won’t want to miss a project!! So any wait to follow your progress! This is so exciting! I can’t wait to follow your progress ! Hi Darla, Thanks for checking us out! Any and all encouragement is welcome! Looking forward to seeing the progress – I love a before and after! Thanks, I am so happy to be getting this room done! Makeovers are the best!